FIGURE 8 ■ Retroperitoneoscopic right adrenalectomy. Dissection between adrenal gland and inferior vena cava reveals short, horizontal main right adrenal vein, which is controlled and transected. Remainder of mobilization of right adrenal gland is similar to that on left side. 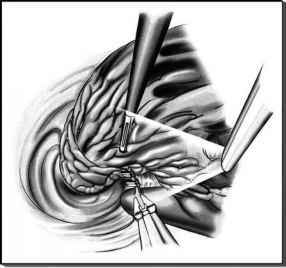 exposure during a retroperitoneoscopic radical nephrectomy, a peritoneotomy during retroperitoneoscopic adrenalectomy may decrease the operative field in the vicinity of the undersurface of the diaphragm. 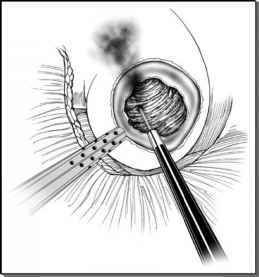 In this circumstance, placement of a fourth port may be necessary for anterior retraction. A 2 mm port suffices for this purpose.